Six years ago, Reem Assil found herself traveling in the Middle East in search of direction. After working on the front lines as a community and labor organizer, she felt she had hit a wall in terms of the impact she was making, and sensed that a loss of community was holding back the people she deeply wanted to help. Reem, whose father is from Syria and whose mother is from Palestine, hoped that reconnecting with her family’s roots would help her find a way forward. “I was trying to make sense of what it was like to be a child of Arab immigrants in the U.S., feeling like a stranger in a strange land,” she recalls. Back at home in Oakland, Reem resolved to recreate the sense of community she had felt in her journeys by starting a bakery where she could share the food and culture of her homeland. She enrolled in a baking and pastry program and took entrepreneurship classes, and for three years she honed her skills catering and working at the worker-owned cooperative Arizmendi Bakery. In 2014, she was accepted into the competitive food business incubator program La Cocina, which served as a crucial next step in making her vision a reality. Through mentorship and a structured curriculum, the La Cocina program helped her take her ambitious vision and turn it into a sustainable business plan. 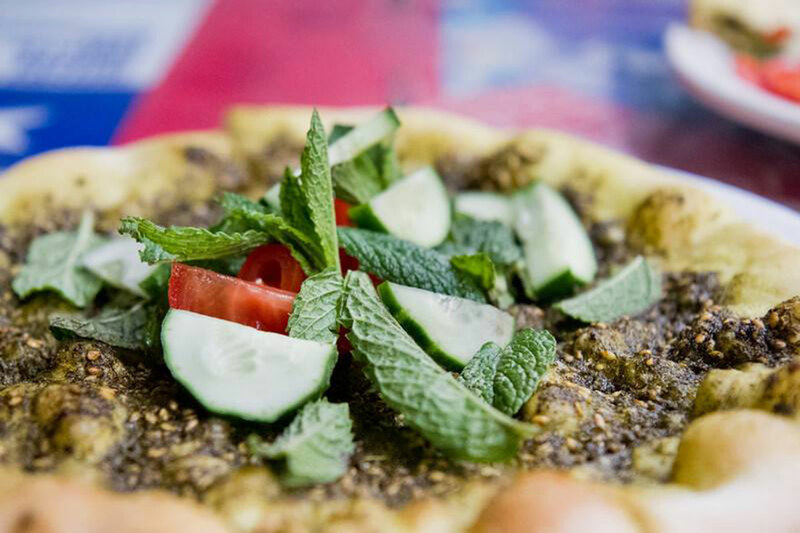 Reem’s specialty is a Lebanese street food known as mana’eesh (man’oushe, in the singular—“like goose to geese,” says Reem). It’s a soft, warm, fluffy, pizza-like flatbread, topped with za’atar (a savory paste of thyme, sumac berry, sesame seed, olive oil, and salt) and fresh vegetables, cheese, or cured meats. 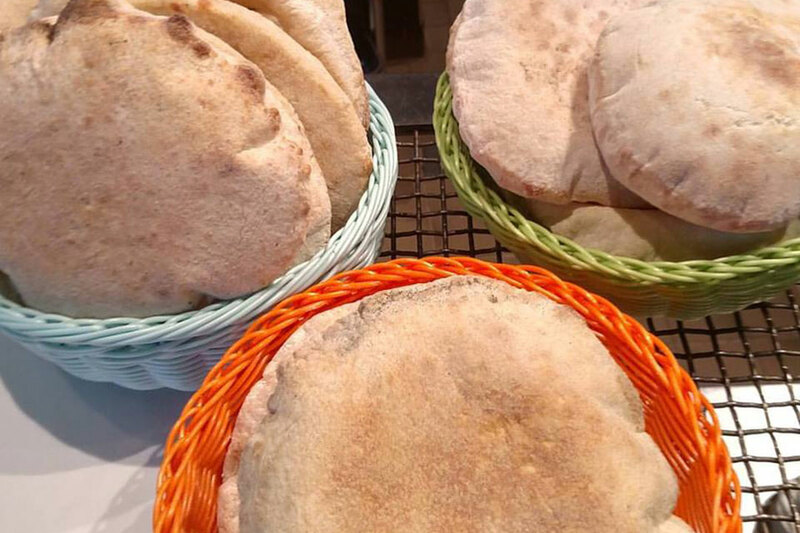 A “quintessential food of the Levant,” it can be eaten open faced or neatly rolled up for an easy, on-the-go snack. Starting with this traditional base, Reem adds her own farm-to-table twist by using toppings from the local foodshed like cherry tomatoes, cucumbers, and mint, or strawberries, arugula, and goat cheese. During the Warriors’ spring streak, her popular “Draymond Green” showcased roasted asparagus and green onions, and this summer, she is excited to roll out a man’oushe featuring charred eggplant, a staple in Arab dishes, in a shakshuka sauce. “We like to play on the seasonal items and make it relevant to what people like in California,” she says. Building on her experiences as a community organizer, Reem sees her man’oushe business as an engine for economic and social change. “We have a responsibility and a role to play in strengthening the community around us, which means making sure that we pay our workers living wages,” she says. As her business grows, she wants to provide job opportunities for people who face the biggest barriers, such as formerly incarcerated individuals or newly transplanted refugees. Inspired by the cooperative model structure of Arizmendi, she believes that taking time to value and invest in her workers will create loyalty for them to stay in it for the long haul. “We want to be a pioneer and demonstrate a model where folks are not only paid a living wage, but also have a democratic say in a lot of business matters that will impact them,” she says. The next stage for Reem is opening a brick-and-mortar in Oakland’s Fruitvale neighborhood. To help realize her dream, she is launching a Kickstarter campaign on August 1, and she is also a finalist in OpenTable’s 2016 Open For Business Restaurant Contest. In a city that is rapidly gentrifying (“It’s like development on steroids!”), she chose Fruitvale as a location because it has been developing more slowly, and she felt her business could integrate organically into the neighborhood. In addition to being a place where people can enjoy freshly baked mana’eesh, she envisions her bakery as a gathering spot for nonprofits and other grassroots groups. “We want to create physical space for people to build community across cultures, generations, and experiences,” she says. In bringing mana’eesh to market, Reem must account for the true costs of sustainably made, socially just food, which is why it is so important that she and her team communicate these core values to their customers. Find Reem’s at the Ferry Plaza Farmers Market on Saturdays. Learn more about her Kickstarter at her launch party in Oakland next Monday, August 1. Update (August 1, 2016): Reem’s Kickstarter campaign is live. Reem Assil portrait by Jung Fitzpatrick. All other photos courtesy of Reem’s.